Rob Wesson, an internationally known seismologist and now popular author, will speak about his new book, Darwin’s First Theory. Everybody knows―or thinks they know―Charles Darwin, the father of evolution and the man who altered the way we view our place in the world. However, what most people do not know is that Darwin was on board the HMS Beagle as a Geologist―on a mission to examine the land, not flora and fauna. Or about Darwin’s seminal role in demonstrating and exploring the ups and down of the Earth’s crust. Retracing Darwin’s footsteps in South America and beyond, Rob trekked across the Andes, cruised waters charted by the Beagle, hunted for fossils in Uruguay and Argentina, and explored sites of long-vanished glaciers in Scotland and Wales. 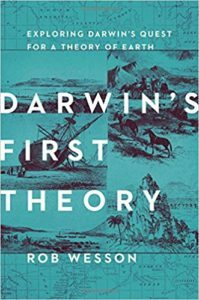 As he followed Darwin’s path―literally and intellectually―he experienced the land as Darwin did, engaged with his observations, and tackled the same questions Darwin had about our ever-changing Earth. As a kid growing up in the Pacific Northwest, Rob Wesson became fascinated by mountains and glaciers. This interest led to a BS in earth science from MIT, and an M.Sc. and Ph.D. in geophysics from Stanford University. 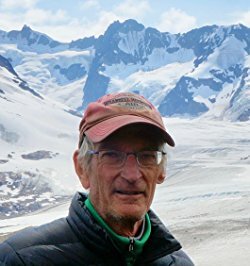 His career in earthquake research with the U.S. Geological Survey (USGS) spans four decades, where he is currently a Scientist Emeritus. In retirement, his research has turned to Chile where he is collaborating with a team exploring large earthquakes, tsunamis, and associated tectonic questions. This work has been supported in part by grants from the National Science Foundation. When not traveling to South America or elsewhere, Rob divides his time between his home in Evergreen, Colorado, and the rustic cabin he built near McCarthy, Alaska. Rob first became interested in Darwin and his geology through reading The Voyage of the Beagle on a vacation trip to Patagonia. He became captivated by Darwin’s prodigious powers of observation and his insatiable need to understand and explain. Whatever rock, fossil, landscape, rodent, bird, or beetle that he found, he wanted to tell its story.